Here at NuFlow Phoenix, we understand that it can be frustrating to experience clogs at your home or place of business. Not only can clogs be annoying, but they can also cause more major problems like causing internal fracturing in your pipes, or causing leakages into the main city lines. That’s why we offer drain cleaning services. Drain cleaning is an absolutely necessary step in clearing out and removing a clog or debris from your pipe. Even if you do maintain your pipes with regular inspections and clear-outs, it’s almost inevitable to have a clog or some sort of obstruction inside your pipes, what with waste, water, and other debris blocking the flow of water over time. We purposefully avoid chemical cleaners because of their corrosive qualities. Since they only offer temporary solutions at best, we are proud to offer hydro jetting as the preferred drain cleaning service across Phoenix, Arizona. It’s both environmentally friendly and ergonomically sound. It’s a solution that can be guaranteed to remove debris and clogs without damaging your pipes. 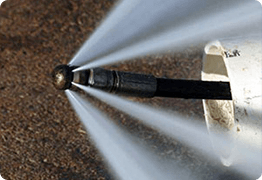 Hydro jetting involves using high-pressure blasts of water to remove clogs and obstructions from inside of the pipes. We are able to control the water pressure manually to prevent any damage to your pipelines. The process uses limited equipment and is a fast service to perform, and the high-pressure of the water allows us to effectively clear out the clogs and cleans the inside of your pipe to a sparkly new material. Maintenance on pipes and sewer lines in Phoenix residences and commercial buildings is a great way to increase their lifespan and efficiency. If pipes are left untended for too long, they can develop clogs, leaks, and fractures in joints and other weak points. When you call NuFlow Phoenix to schedule an inspection on your pipes, we use environmentally-friendly tactics, including trenchless-based camera and cleaning equipment, in order to diagnose and remove the problem quickly and efficiently. With regular checkups performed every three to six months, and right before seasonal changes, we can help decrease the possibility of cracks, fractures, leaks, and clogs from forming inside of your pipes. Call NuFlow Phoenix For Professional Drain Sewer Line Cleaning Services Today! NuFlow Phoenix has some of the best, high-end technologies available in the pipeline industry. This means that you get the best work done with the best equipment and tools available. Not only that, but we have a technician crew that’s capable of handling those tools and providing you with the best experience you can have. Because your comfortability and happiness with our completed work is what matters most, client satisfaction is the top priority along with job completion here at NuFlow Phoenix. So trust us with your plumbing care- you won’t regret it. Call us today for your local drain cleaning services offered with a free quote as well. You can reach us at (480) 508-6634, and we look forward to working with you today!